3 months ago, we told you fight between the Government controlled company, Sunshine Holdings Limited and the Ashcroft Alliance. They're in court over compensation money that the Government paid the Alliance in the half a billion-dollar settlement for the BTL acquisition of 2009. Today, Justice Courtney Abel heard opening arguments in a 3-day trial to determine just who should have been paid, and who should not. As viewers are aware, it has been over 8 years that the Barrow Government and the Ashcroft Alliance has been fighting over the nationalizations. Last year, in November, GOB finally finished paying off the settlement, but not long after that, Sunshine Holdings began crying foul. Sunshine Holdings is one of those companies with an interesting backstory. It was once a part of the Ashcroft Group of Companies up until 2009, when the Barrow Administration acquired all the shares in BTL in the nationalization effort. It then switched hands and became government controlled, and at present it still is a Government company with a sole appointed director, Nestor Vasquez. The problem is that Sunshine once owned 11 million shares in BTL, and the former owners of Sunshine, Dean Boyce and the Trustees of the BTL Employees Trust, made a claim for compensation. We learned today that they were paid over a 100 million dollars. The problem is that in order to purchase those 11 million BTL shares, Sunshine, while it was Ashcroft controlled, made a loan of 10 million dollars from the Government, and an additional 10 million from the Social Security Board. Those loans were made during the Musa Administration, and at this moment, the Government controlled Sunshine still has that debt, and no money to pay it. So, they are disputing the payment of the compensation money to the Dean Boyce and the Employees Trust. Their position is that those BTL shares were never actually owned by the former owners of Sunshine. They say that it was owned by the company itself, and that since the Barrow Government took over the company's shares, the company, which is now government controlled, should have been the ones paid for the shares. The problem is that the half-a-billion dollar payment has already been made. That cake has been cut, and Sunshine didn't get any of it. So, they're hoping that the Supreme Court will order Dean Boyce and the Employees Trust to return that compensation payment to them instead. Sunshine's attorney, Rodwell Williams, made opening arguments today and 2 witnesses, including Financial Secretary Joseph Waight, were called to testify. In response, Eamon Courtenay, who is representing the BTL Employees Trust, carefully cross-examined Financial Secretary Joseph Waight, and he focused on the very close connection between the Government and Sunshine. Courtenay cross examined Joseph Waight who admitted that Sunshine never made a claim for compensation, which from their perspective was the proper thing to have been done. He also got the Fin Sec to agree that if Sunshine had made a claim for compensation, they would have most likely been successful. Another major element of Sunshine's case is an assertion that the Government kept promising them that they would be compensated for their shares, and that's why they didn't press for payment until after they realized that Government had no compensation to give them. Courtenay was able to get the Fin Sec to agree that he knows of no such promise, and that he would have been the most appropriate Government official to give Sunshine such a commitment. The case continues tomorrow, and concludes on Friday, which is when the attorneys have indicated to us that they would be free to grant comments. We'll keep following the case. For 3 days now, Justice Courtney Abel has been listening to arguments on the last court fight over money connected to the half a billion dollar settlement over BTL. The judge is being asked to determine who should - and shouldn't - have been paid over 114 million dollars out of the entire amount. The Government controlled company, Sunshine Holdings Limited, is claiming that the amount should have been paid to them, and that the Barrow Government wrongly paid it to the former owners, Dean Boyce and the Trustees of the BTL Employees Trust. When it was an Ashcroft Company, Sunshine held over 11 million shares in BTL. All that changed in 2009, when the Government nationalized the telecoms company. In one fell swoop, the Government acquired all of those shares, and it also took over Sunshine itself. The BTL Employees Trust, an Ashcroft entity, has been arguing since then, that the Government takeover was unlawful, and that they should be compensated. That was done, and full payment of the entire half a billion dollar debt was finally completed in November of last year. A big problem with that is that the in order to have purchased those shares in BTL in the first place, Sunshine, when it was an Ashcroft Company, made a loan from the Musa Administration, and the Social Security Board. That loan totals approximately 20 million dollars, and it is still owed. So, when the Government paid the entire compensation to Dean Boyce and the BTL Employees Trust, it left the Government controlled Sunshine in the lurch. It suddenly had no assets, no money, and this huge debt outstanding. So, that's the context for this 3-day lawsuit. Sunshine and its sole director, Nestor Vasquez, are asking the judge to grant them restitution, which would force the BTL Employees Trust to pay them the entire sum. Well, the judge listened intently to arguments from both sides, and 2 hours after the 3-day case was finished, he had a oral decision ready for the litigants. He did not need to reserve judgment to completely trash Sunshine's position. He dismissed their claim and ordered that Sunshine pay costs in the lawsuit, and he also had a few choice comments for the claimant. Justice Abel said, quote, "It seems to me that Sunshine is not seeking to get justice. It is seeking to get a windfall… This court will not allow its process to be used to permit that… This court cannot find that any of the monies paid... have been wrongly made or directed… There is no merit in Sunshine's claim… The claim is dismissed." End quote. "I had started from yesterday saying that this was a bizarre claim, and it was Sunshine, which is owned by the Government, suing the Trust, and suing the Government, seeking to get compensation that had been paid by the Government to the Trust. So, it was a rather circular situation, the Government's company suing the Government and the Trust to get compensation from it. The judge refused to do that, accepting our submissions because all the monies that have been paid over was paid over by way of the settlement agreement, which went to the National Assembly, was approved by the National Assembly. 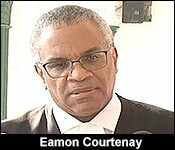 There were repeated challenges in the CCJ as to the amounts to be paid to the Trust, and the CCJ approved the payments. So, it was rather bizarre for us for Government to have Sunshine come here, and try to get back some of the money. In fact, they were claiming all the money, and alternatively, about 50 million dollar. The judge found that it was what he described as a colourable device, which in my words, not the judge's words - in my words - borders on fraud. You cannot pay money to somebody under an agreement, approved by the court, and then, a few months later, get somebody to come on your behalf to get back that very same money. I said it before, and I say it again, it is a bizarre situation. I say again to Belizeans, hundreds of thousands of dollars of taxpayers money are being paid to attorneys by the Government of this country to bring spurious claims. It is the people who are paying for all of this, and it is sad, and it ought to stop." But, as we told you, Sunshine, which is under Government control, owes 20 million dollars in to SSB, and to the Government. It was hoping to get some of the compensation money to pay that off. The reality is that with this loss in court, the Government, and by extension taxpayers, will now have to foot that bill. "We went through all the evidence, and the evidence showed that from way back in 2012, the Government gave its assurance to Social Security Board that the money that was owed by Sunshine to the Social Security Board, the Government would pay it. Up until 2016, after the settlement agreement, Social Security wrote to Government said, 'Pay me as you promised to pay me.' The Government has not made good on that. In the settlement agreement, clause 5.4, it is made very clear that this liability remains with Sunshine, which is Government-owned. It is simple, as far as the Trust is concerned. An honorable agreement was made on the 11th of September 2015 between the Trust, Dunkeld, and the Government. Monies were paid. It was honored, and the Government should stop these spurious attempts to try to undo that which it agreed to do. There must at the end of the day be an end to litigation, and an end to this endless spending of public money." "So, the Government - the Sunshine Company, won't get any of the 114 million dollars total, and the Government also has that 20 million dollars debt that it has to now absorb. Is that correct?" "That is correct, and as the judge pointed out, and we keep pointing out, why is it that Sunshine never made a claim for compensation? When this acquisition took place in 2009, and was repeated in 2011, Sunshine never made a claim for compensation. It never made a claim for compensation because it would Sunshine, owned by the Government, claiming from the Government compensation. As I had said in a different case, it's stupidity on stilts, and the judge rejected it comprehensively. It is a really ridiculous, bizarre, and expensive frolic by the Government. Enough is enough. It is comedy and - I don't know who is ruling the asylum that the Government is in, but we really have reached the bottom." After the case, the press attempted to get an interview with Rodwell Williams, the attorney for Sunshine, but he did not grant any. We later went to his law firm, but we were told that he was in a meeting. So at long last, is it over? The now nearly nine-year saga of Telemedia’s acquisition by government started in August of 2009 and effectively concluded with the settlement in 2015. That settlement was defined and ratified by the C.C.J. in October 2016 and again in November 2017 as to the level of payments to both the Employees’ Trust and Dunkeld Investments. The Sunshine case was spun out of the latter, but with its comprehensive defeat, Courtenay told reporters that the government must quench its thirst for this case. And while the PM had it easy enough navigating legalistic questions about Belizean sovereignty, it didn't go as smoothly when we asked him about his government's latest defeat at the hands of the Ashcroft Alliance. As we told you last week, the Government controlled company, Sunshine Holdings Limited, tried to convince Justice Courtney Abel to order the Ashcroft entities, Dean Boyce and the Trustees of the BTL Employees Trust to give them back part of the 114+ million dollars they collected as part of the half a billion-dollar settlement over BTL. Sunshine claimed that the Government wrongly paid compensation to the Alliance for 11 million shares in the telecoms company that were once assets of Sunshine, back when it was an Ashcroft company. 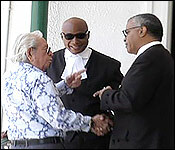 For 3 days, the two sides presented their case to the judge, and 2 hours after the end of the case, he delivered a oral judgement completely rejecting Sunshine's claim. That's a significant defeat for the Government because when they took over Sunshine, they, and by extension Belizean taxpayers, became liable for a 20 million-dollar investment loan that Sunshine made to purchase those shares. So, Sunshine was attempting to get at least a part of the 114 million dollar compensation payment to pay off that debt. But, the Supreme Court will not entertain them in their attempt to force the Ashcroft Alliance to give back that money. "I will go further to what I said earlier and express the hope that Sunshine will appeal. Indeed, the liabilities for those, or the liability for those investment loans under the settlement remain with Sunshine and that is the entire burden of the Sunshine court application. Since the Ashcroft people collected the compensation for the acquisition of the BTL shares, which originally were held by Sunshine, they should be made at the very least to put Sunshine in funds to settle the liability for the investment funds. Clearly, Sunshine has lost that application before the Supreme Court but I am confident that there will be appeals launched." "Persons looking on ascribe blame specifically to you as one of the persons who negotiated the BTL settlement; that you should have paid attention to this particular detail to insulate the taxpayers from that investment loan debt." "Whatever blames you or anyone else would wish to ascribe to me, I am able to deal with it. You can say, nobody can quarrel with you for that, that perhaps the agreement might have been far more tightly drawn so that the objective that I sought to achieve would have been placed beyond any possibility of challenge. That is not any opinion or conclusion that I would begrudge you but not only do we at least get back $10 million, the fact is you can't lose sight of the central consideration. Compensation was due and without my effort of trying to mitigate the burden of that compensation we would have had to pay everything, including the $10 million we got back. With respect to that assessment, it turned out to be significantly- extraordinarily so- significantly less than what the Ashcroft Alliance had claimed. The expectation certainly was that the compensation would have been far greater than it turned out to be. 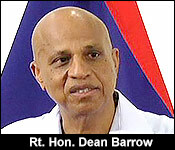 That alone was a tremendous victory for the people and government of Belize."